The impressive geologic formations of Valle de la Luna in Chile's Atacama Desert. Looking for some new places to see wildlife, birds, and natural beauty? These lightly-visited destinations might just do the trick. If you have the travel bug and have been to a few far-flung places around the globe, you may feel a certain drive to discover new and exotic natural wonders to add to your bucket list. And, if you’re like me, you don’t necessarily want to visit the same places that the teeming masses are drawn to. There are still many destinations out there that can offer us adventure, wildness, and natural beauty without the tourist crowds. Ideally, we can find such places that are also reasonably safe and generally delightful, even if visiting them might include a few (hopefully pleasant) surprises and a dash of uncertainty. I mean, that’s travel, right? Here at Wild Latitudes we love to travel and we love nature! We’re continually developing new itineraries and destinations for our tours. The places listed here are high on our list of potential tour destinations and might be worth adding to your own travel bucket list. These destinations are a bit out of the way for many of us and not necessarily on the radar of the standard traveler. Each of them represents a happy middle ground between heavily-trodden and inaccessible. We hope this list inspires you to further research some of these places for your travel adventures! Few large countries are as wild, rugged, and seemingly-empty as Mongolia. It is a land of endless steppes, forested mountains, and stark desert. Tourism infrastructure is still developing in Mongolia, but the challenges of access and the relative solitude are what attract many travelers. Amazing cultural experiences abound here: historic sites related to Chinggis Khan, staying with nomadic families in their traditional ger tents, and horse riding. Wildife viewing and birdwatching are outstanding in Mongolia. Wild horses, gazelles, wolves, lynx, and more than 400 bird species can be seen here. 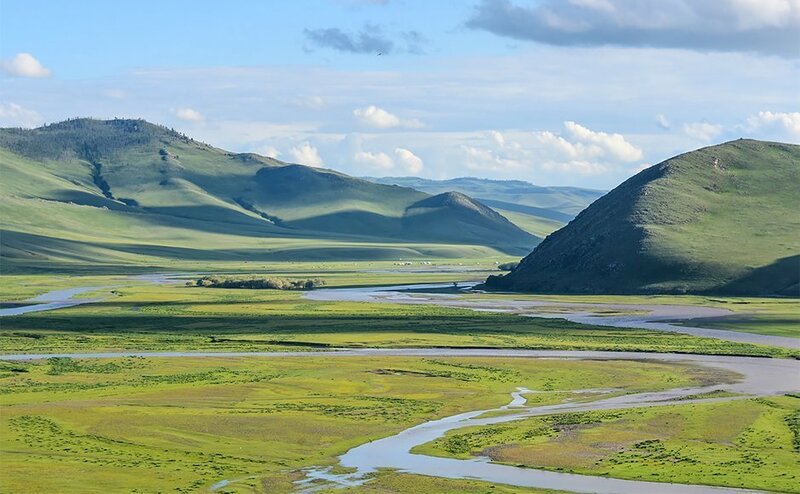 A protected area in northeastern Mongolia that encompasses steppe and wetland ecosystems. This UNESCO World Biosphere Reserve is one of the best places to see breeding White-naped Cranes. This park protects the world’s only true wild horse species: the Takhi (also known as Przewalski’s Horse). You can see these stout little horses in the park as well as a wealth of other wildlife such as wolves, badgers, and the Pallas Cat. Explore a vast desert in the heart of Asia. Mongolia’s Gurvan Saikhan National Park is a great place to visit if you want to see spectacular geological wonders, rare desert birds, and wildlife such as Wild Bactrian Camels, Ibex, and Argali Sheep. A meandering river in the Mongolian countryside. Photo by Richard Mortel (Flickr). Amazing biodiversity exists in Vietnam’s cloud forests, jungles, limestone hills, and wetlands. A disproportionately high number of new vertebrate species have been discovered here in recent decades. As you search the wilds of Vietnam for endemic birds and other wildlife, you’ll be treated to breathtaking scenery and cultural delights. 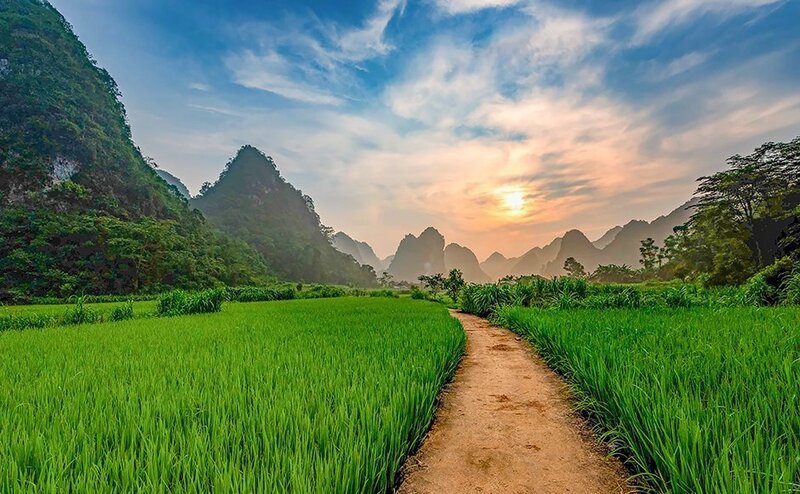 Ha Long Bay draws much attention from travelers, and rightly so, but there are many more sites for nature lovers to explore in this beautiful country. Limestone mountains and hills in this province provide an otherworldly backdrop to the lush, picturesque valleys. Cúc Phương National Park is one of the country’s most important protected areas. It harbors numerous primate species, including endangered langurs. About 30% of the animal species found in Vietnam find protection within this park. In addition to a handful of primate species, this area is also home to Sun Bears, Asian Elephants, Sunda Pangolins, more than 350 bird species, and many other animals. Rare wetland habitat is found in this park, located in the Mekong Delta. Many different bird species can be seen here, including the amazing Sarus Crane. Limestone Karst hills in Ninh Binh Province, Vietnam. Photo by Rod Waddington (Flickr). Besides Poland’s fascinating castles, beautiful cities, and sobering war-time historical sites, the country contains some of Europe’s best and last tracts of wilderness. Many of the wildest places are in Poland’s northeast corner, although the lofty Tatra Mountains are in the southwest. Visit Poland for a great mixture of Europe’s fascinating human and natural histories. This is the largest remnant of Europe’s ancient deciduous forest. Some true old-growth remains protected within Białowieża National Park, which is home to European Bison, wolves, lynx, and many birds. It was designated a UNESCO World Heritage site in 2014. Visiting this special forest will make you feel like you’ve walked into a storybook fable. A jumble of river channels, marshes, bogs, and woodlands, this area is home to a huge number of birds and other animals. Over 250 bird species have been seen here, making it one of Europe’s great birding hotspots. These majestic peaks create the divide between Poland and Slovakia to the south. Tatra National Park is great for hiking and looking for wildlife. Brown Bears, Tatra Chamois, marmots, and other animals roam its highlands and forested canyons. 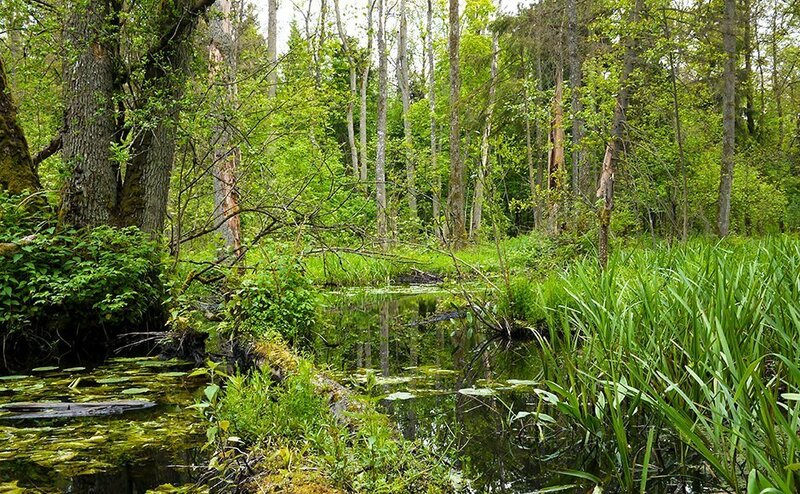 Europe’s last great forest is preserved in Białowieża National Park in Poland. Photo by Frank Vassen (Flickr). The biodiversity hotspot of New Calendonia has been around for many millions of years, having once been connected to Australia. The plants and wildlife here echo the primeval world of Gondwana. Forests of giant tree ferns and the strange pine-like Araucaria are home to reptiles, butterflies, and more than 20 endemic bird species, including the unique Kagu. The beautiful lagoon surrounding New Caledonia is a UNESCO World Heritage Site and the snorkeling here is world-class. 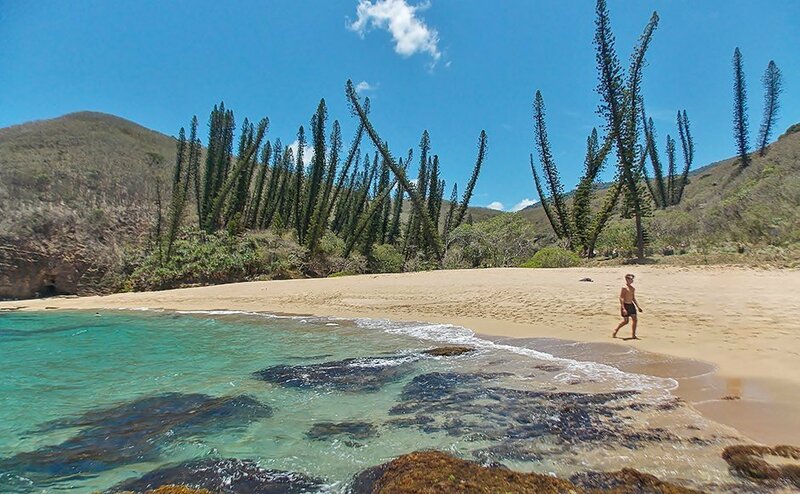 This provincial park protects tropical rainforest and maquis shrubland ecosystems. It is home to the largest population of the strange, flightless Kagu bird– an icon of New Caledonia. Numerous hiking trails wind through a rich rainforest in this park. This is one of the best places to see most of the main island’s (Grande Terre) special birds. An island paradise complete with seemingly endless white beaches, turquoise waters, and diverse coral reef creatures. On top of that, this is the only place in the world to see the rare Ouvea Parakeet. The wilds of New Caledonia have a strange, primeval flora, including trees such as these Araucaria columnaris. Photo by Gerard (Flickr). Get inspiration for your next travel adventure! 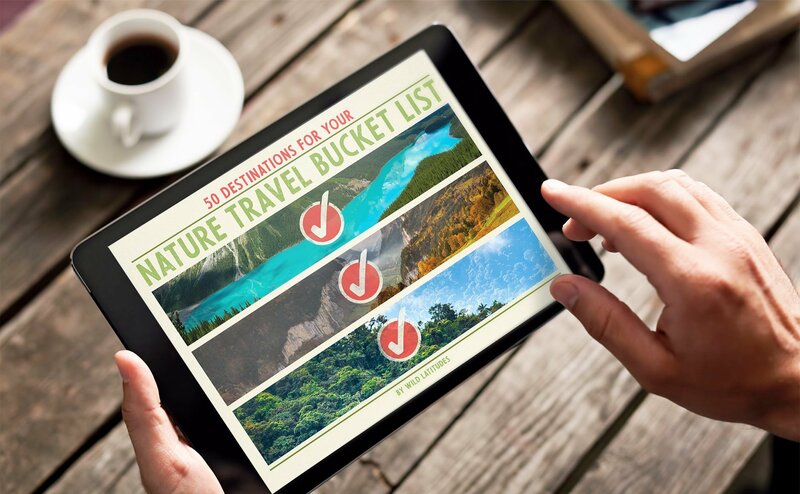 Download our FREE PDF Guidebook to amazing natural wonders across the planet. Chile stretches about 2,600 mi (4,300 km) from top to bottom. Numerous and varied ecosystems can be explored here, from the world’s driest desert to temperate rainforests to the wind-swept glacier fields at the southern terminus. Great food and culture– both modern and historical– can be enjoyed along the way as you experience Chile’s natural wonders. Almost no rain falls in this vast desert, which is often likened to the surface of Mars. Plants and animals may be sparse on the landscape, but the topography and environment alone are worth the visit. 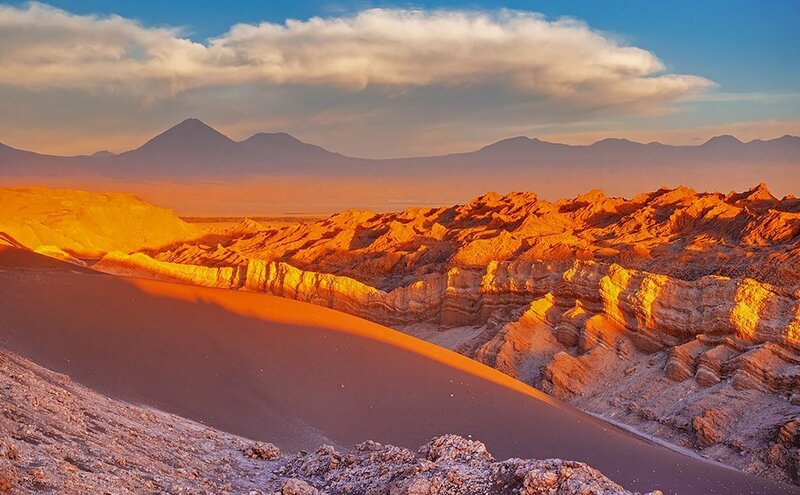 One of the more spectacular geological sites is Valle de la Luna. The countryside beyond the town of Perto Varas is strewn with gorgeous lakes, lofty volcanoes, and ethereal forests. Two of the best places to visit here are Alerce Andino National Park and Puyehue National Park. The veritable Edge of the World, at the southern tip of the continent, Tierra del Fuego is a land of true wilderness. Getting here takes some work, as does getting around on the Chilean side of the big island (Argentina owns the other half, which is more developed for tourism). Wildlife includes numerous sea birds (including penguins! ), elephant seals, guanacos, dolphins, foxes, and more. 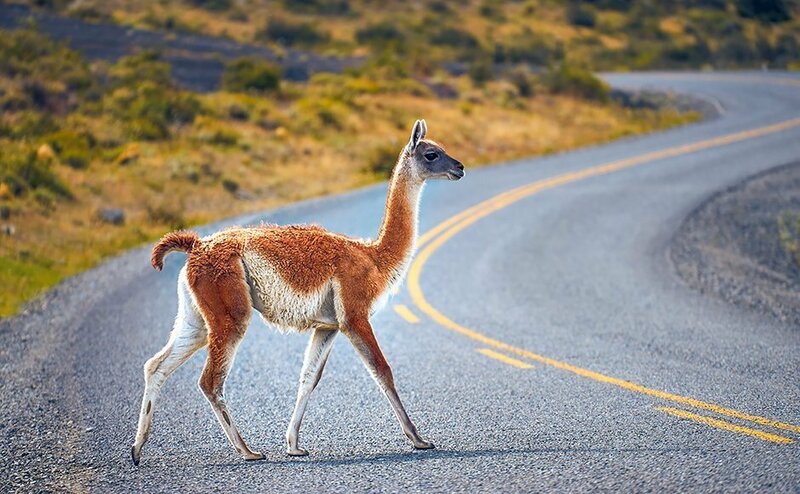 A Guanaco (Lama guanicoe), the wild relative of the domesticated llama. Photo by Deensel (Flickr). Guyana is off the beaten path for many travelers, compared to many other South American destinations. Nevertheless, it is an incredibly attractive destination for the globe-trotting nature lover. The Guianan rainforest is the largest continuous tract of lowland jungle on the planet. The pristine quality of this ecosystem, combined with the amazing neotropical birds and wildlife to be seen here, can make for a spectacular experience. Guyana is definitely for more adventurous travelers, however. Consider joining a group tour of the country, rather than traveling there on your own. Measured by volume, this is the largest single-drop waterfall on Earth. It plunges 741 feet down from the lip of a cliff, surrounded by lush rainforest. Experience the incredible beauty and biodiversity of the Guianan rainforest. Major lodges have canopy walkways here, where you can look for birds and arboreal creatures among the branches. With luck, it’s possible to see Jaguar here, as well as the unrivaled Harpy Eagle. Golden grasslands dotted with big termite mounds and pockets of lush forest await you in west-Central Guyana. Meet the welcoming Amerindian people of the region as you go in search of birds, wildlife, and beautiful scenery. 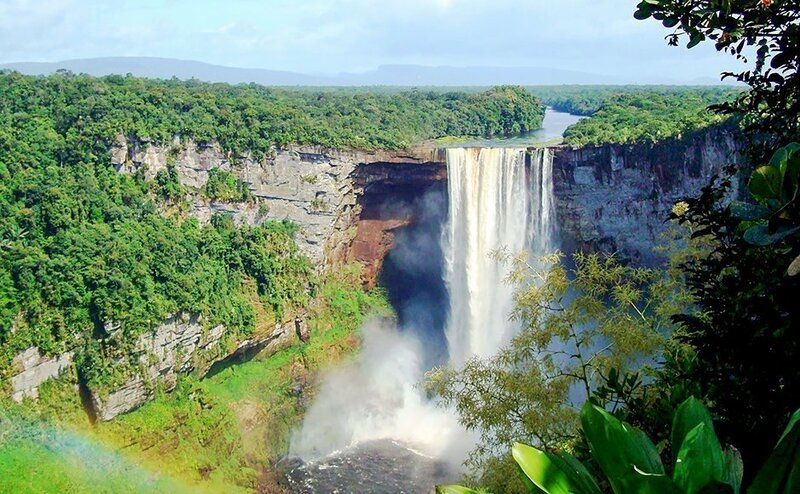 Kaieteur Falls in the South American country of Guyana is one of the most spectacular natural wonders in the region. On Newfoundland Island, nature surrounds every small town and village. This rocky, boggy land is great for hiking and wandering. On the coast, you can go sea kayaking with whales, puffins, and icebergs.You can also visit North America’s oldest city, St John’s and see where Vikings had a toehold on the continent over 1000 years ago. Boat tours in this area will give you up close experiences with puffins and whales. This is one of eastern North America’s most important seabird nesting regions. A UNESCO World Heritage Site, this park has geologic marvels such as the Tablelands, great hiking, and well over 100 bird species to find in the summer months. Just south of St. John’s is this large nature reserve, which can be enjoyed on foot or canoe. Birding here is productive and it’s also the best place on the island to see wild Caribou. 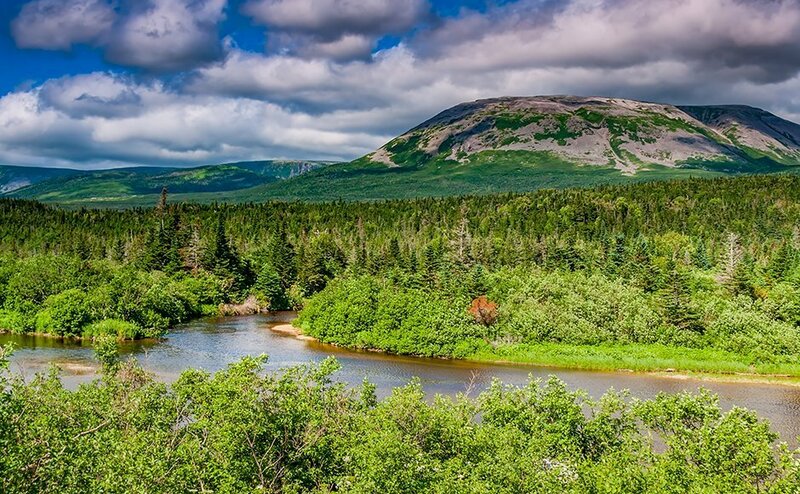 Gros Morne National Park in Newfoundland, Canada. "50 DESTINATIONS for your NATURE TRAVEL BUCKET LIST"